When winter and the cold temperatures arrive, our deep valleys display their most beautiful gems. Climbing frozen waterfalls is not exclusively reserved for ice climbing mountaineers. Indeed, with a specialised guide, everyone can try. The Pays des Écrins is a paradise for ice climbing. It is time for new experiences that will make you push your limits as you approach the summits. Just imagine what you are capable of. 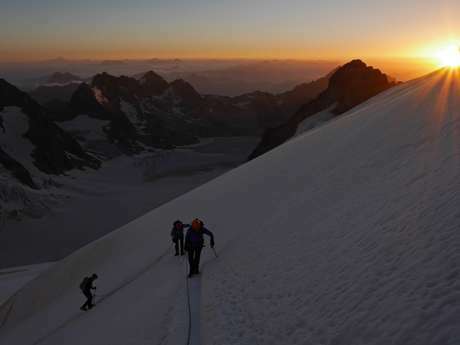 Time for a taste of the extreme activities, to live your love of risk to the full, set off wholeheartedly to face the summits and face the gradient: mobilising your emotions, that continue to run higher and higher. Adrenaline rush guaranteed! So, ready for the big thrill? When winter is here, the Pays des Écrins seems different. The ephemeral world of the ice reveals itself. Progressively, the waterfalls freeze creating ice forms or other extraordinarily shaped stalactites. In a one-of-a-kind, subdued, almost secretive atmosphere, finding balance and progressing across an unstable surface, throwing your ice axe into the ice and shaping it like a multifaceted diamond, feeling your heart leap while suspended in mid-air, all create a unique experience! The Fournel and Freissinières valleys are remarkable sites to carry out this activity which is midway between mountaineering and climbing. The first, secluded, is home to staggering terrain with many fantastic ice lines: cross a troubled yet surprisingly natural environment which will not disappoint you. As for the Freissinières Valley, it is one of the main ice spots in the Pays des Écrins and is internationally renowned. It is particularly pleasant and accessible (all sectors are marked) and is a gem for ice climbers who are enthusiastic to go there, particularly during the Ice Climbing Écrins event that takes place each year. When supervised, ice falls are accessible to everyone. We strongly advise calling on a professional to fully appreciate your climb or, if necessary, to learn or improve your climbing techniques in safe conditions. There are four falls for beginners across the area: in Pelvoux, Puy Saint Vincent and L’Argentière-La-Bessée. Fall No.1: Fracastorus – Freissinières Access: From the car park in the Bellons locality, cross the bridge and go up the steep woods towards the fall. Fall No.2: Claphouse – Pelvoux Access: To reach the artificial ice fall in Pelvoux, go past the Pelvoux-Vallouise resort and follow the road to the tunnel in Les Claux. Park your car, go through the tunnel and the fall is then on the left. Fall No.3 – Géant des Tempêtes – L’Argentière-La-Bessée Access: La Salce car park, if the road is open. Then, from the car park go to the top of the Fournel Valley. Géant des Tempêtes is the last fall on the right. Fall No.4 – Beating the retreat – L’Argentière-La-Bessée Access: Car park in the Fournel Valley (sheep pens, Deslioures Reserve). Continue for roughly twenty minutes on foot in the Fournel Valley and you’ll see the fall on the left. Be aware of the equipment in place. Do not overestimate your physical or technical ability. Enlist the services of a high mountain leader who will choose an outing that suits your abilities. Make sure you check the weather forecast beforehand. Ask professionals for information on the snow and ice conditions and change route if they are not good. Make sure your equipment is suitable for the outing (helmet, harness, ice axes, crampons, etc.) don’t forget the safety equipment (shovel, probe, transceiver), and don’t wait until you’re in trouble to learn how to use them. Never leave by yourself and let friends and relatives know your route and your approximate return time.